The combustion of highly exothermic heterogeneous mixtures containing metal oxides (FeO, Cr2O3) and metallic (Al) or nonmetallic (C) reducing agents has been studied under dynamic conditions. A relation between the temperature of ignition and the ratio of the components of the mixture has been established. 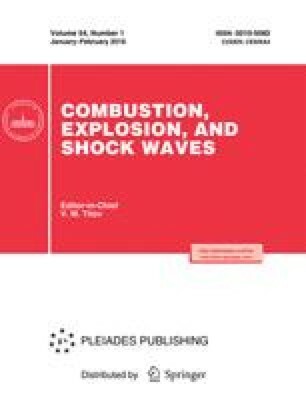 The ignition temperature was compared with the theoretical value derived from the quasisteady theory of ignition of condensed systems of hot material with a high thermal conductivity and a variable surface temperature. The theoretical values were in agreement with the experimental results. Chernogolovka. Translated from Fizika Goreniya i Vzryva, Vol. 29, No. 4, pp. 46–48, July–August, 1993.